This is just a sample of the feedback we get from our happy clients. Just to say thank you very much for organising all the trips I had, I had a great time! I have to say that the service I got from you was always very professional and to western standards, which gave me a lot of confidence. The fact that you sent an invoice and the other documents with practical information and more was excellent in particular. As I mentioned on the first day over the phone, DJ is such a lovely guy. He also displayed very high standards of service and he was great company too. His driving is excellent and he really knows how to look after people. When we decided to visit Ethiopia, we first booked our flights then we had to work out how to fill the six weeks between arriving and leaving. We found five Addis Ababa tour operators via Google and approached all of them with our brief for a tailor-made trip. Two didn’t respond. One responded by cutting and pasting from their standard tours, not taking any notice of our brief – and when we sent back our comments with suggested amendments, we never heard from them again. Another operator provided an itinerary that was shockingly expensive and when we queried the cost, they knocked £900 off without asking – and it was still expensive. So what were they up to? Although Abeba Tours obviously did a bit of cutting and pasting too, before sending the resultant itinerary to us, they looked at it and then made changes that better suited our brief. We responded with requests for more changes, which they quickly implemented. When it came to payment, we were nervous about sending such a large sum of money through the international banking system to a company we found on the internet and one that we still didn’t really know, so we insisted on paying by credit card even though that attracted a premium - we regarded that premium as our safeguard. They were agreeable. But we needn’t have worried – we could have saved that extra cost! Bearing in mind the difficulty of operating in a country like Ethiopia (e.g. poor telephone communications, intermittent internet, no sense of urgency by some of the hotels, the peculiar system of advance booking hotels in Ethiopia, power cuts, etc. ), Abeba Tours were faultless. We had a complicated schedule that involved five flights, several boat trips, a trekking expedition, almost 20 different hotels, eight different guides, lots more local guides, armed scouts, a plethora of entry fees and the use of a very new Toyota LandCruiser with driver/guide for 17 days. So there were plenty of opportunities for things to go wrong bearing in mind we were in Ethiopia, not a Western country. Nothing went wrong. We were met at airports, we were delivered to the hotels we had agreed, when we were taken to see the things we wanted to see we were collected on time. With one exception the guides were very knowledgeable and spoke good English – for some, their English was excellent. We can wholeheartedly recommend Abeba Tours – and you can send your deposit money in advance with confidence. Being safely back in Riyadh now and having had a few days to digest my experiences in Ethiopia, I am now prepared to offer the following review. The vehicle provided was excellent, no problems whatsoever, comfortable and always kept clean. Our driver/guide, Abay, was outstanding. Always on time, polite, easy to deal with, we both enjoyed his company and found it interesting to talk about Ethiopia from him. Although a few days were long, exceeding 12 hours on the road, Abay never seemed tired and was always the same helpful and cheerful young man. We both highly recommend him. The hotels were good, with perhaps a couple exceptions. We found the Kuriftu Resort to be expensive for the poor standard of services received. And the Taye Hotel in Gondar leaves much to be desired, but both of us have traveled extensively in challenging destinations, and we were not terribly put out by the poor standard of some properties. Ethiopia truly amazed me, and Asheem tells me that he also enjoyed it. I have traveled extensively in 61 countries, 15 of them in Africa, yet Ethiopia is simply the most stunning of them all. I never tired of the constantly changing dramatic landscapes, and what made them even more interesting was the fact that I knew, at the end of the day, I would be arriving at another fascinating destination with a rich and mostly unknown history. In sum, we thoroughly enjoyed the tour, and would (and actually already have) heartily recommended Abeba Tours to anyone considering a visit to Ethiopia. Furthermore, while we were still on the ground in Ethiopia, Asheem and I both picked Abay's brain so to speak so as to devise the best itinerary for an upcoming tour to the south, which we will arrange with you (of course!) a little further down the road. I have traveled on dozens of private land tours similar to my tour with Abeba, but my level of satisfaction with Abeba, from the planning stage through the actual travel is right up there at the top. It was a pleasure to meet you in Addis, and I take this opportunity to thank you for your high level of service. I wanted to write to say a big thank you for organizing such an amazing trip for my parents and I! Everything couldn't have gone more smoothly, and all of the people who we met along the way were fantastic. It was such a special trip! First of all I liked how your tour operator & I worked out together the itenary briefly when I walked in at the office in Addis and how you updated it (leaving flexibility e.g. plan A and plan B). Handling the deposit (paying upon arrival) was done as suggested in emails. When we finally started our trip a new, clean car was provided. Our driver was a safe driver who managed very well with the –sometimes –crazy traffic conditions. He was always friendly, on time and we often had a good laugh when traveling. We will definetly recommend Abeba Tours and come back to you on one of the tours to the cultural North. I just wish to personally thank you all for the superb time we had recently in Addis Ababa. We were all so impressed at the professionalism of our ground arrangements with your company, your office staff's resourcefulness in getting us to a hospital (for a tour) at such short notice, our guide's endless knowledge and good humour and our driver's friendliness and adaptability!! We were truly impressed and wish your company every success. 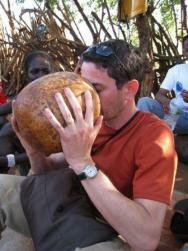 Omo Valley was an amazing place, with all the different traditional cultures, the Hamer, Mursi, Karo, Dessanech etc. The Hamars were the favourites, friendly and beautiful as they were. We even had the privilege to attend a bull jumping ceremony, an unforgettable experience, but what a shame to see the thoughtless behavior of some tourists. On the way back from the Omo Valley we visited the Konso and Dorze people, and in Arba Minch we made a boat trip on Lake Chamo, seeing large numbers of huge Nile crocodiles. A short flight from Addis Ababa to Lalibela with Ethiopian Airlines completed the tour. Lalibela was definitely worth it. It was a moving experience to see the rock-hewn churches, the priests and all the pilgrims. We had the privilege to visit the very beautiful church of Yimrehanne Kristos too. After the flight back to Addis Ababa on the last day in Ethiopia, we managed to pay a visit to Lucy in the National Museum, the Holy Trinity Cathedral, and finishing in company of Girma in a restaurant with traditional food, song and dance, before driving to Bole Airport and the long night back to Europe. Ethiopia easily lived up to our highest expectations. Abeba Tours did a perfect job, everything went smooth from arrival in Bole Airport to departure. It was a pleasure to make plans for the tour with Tania, and the long drive to the Omo Valley in a new Toyota Cruiser with Girma was a journey of a lifetime. He was a safe driver and a good guide. We miss him very much. I am sure we will return to Ethiopia and make a new (and longer) journey to the Omo Valley, which has fascinated us so much. We will recommend Abeba Tours to anybody planning a trip to Ethiopia. My husband, sister-in-law and I organized a 5-week custom tailored trip with Abeba Tours. Our itinerary 'packed in' everything that tourists typically want to do including the northern circuit, Harar in the east, trekking/camping in the Simien Mountains, walking in the Bale mountains, and finally visiting the tribes in the Omo valley. It was a trip like no other that we have taken in over 50 years of travel and backpacking in all parts of the world. Ethiopia is one of the most varied countries in terms of geography and people that we have had the privilege to visit. We certainly could not have done and seen what we did without the fantastic support organized by Abeba Tours. The whole trip down to the last detail ran smoothly including the many iterations of our itinerary before our trip, bookings and details for 5 flights within Ethiopia, changes in itinerary and accommodation when we discovered half-way through the trip that we were not up to 5 days of trekking in the Bale mountains, and all payments to hotels, local guides, native villages etc. The trip was also as comfortable as it possibly could have been given the excellent jeeps provided by Abeba. Above all, both of our drivers, Wegene and Abayneh were fantastic. They could drive superbly on both good and bad roads, and were knowledgeable, prompt, patient with us and the many obstructions on the roads (construction, cattle, goats, donkeys), willing to go the extra mile, and fun to be with. Simply put -- it was a great trip even for 'oldies' like us who are in our early seventies. Thanks again!!!! 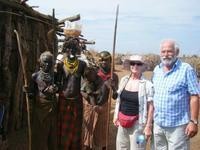 My wife and I arranged a four week drive with Abeba Tours. I had researched Ethiopia a lot before and had gone thru Tripadvisor.com and other search engines and Lonely Planet and what kept showing up was Abeba Tours. A well trusted local company. I then contacted some companies and Abeba was the one that got back to me the fastest each time. I chose them from that and the testimonials that said they were easy to work with and very accommodating. We were so happy we did. We have traveled all over the world and have driven ourselves , had drivers, and have been on tours and this trip turned out to be one of our best road trips. Thanks to our driver, Asegid Alemu!! On a four week trip the driver can make or break an adventure. Asegid has a great sense of humor, has a deep knowledge of his country and its’ Religions, he knows a lot about the whole world and he’s a safe driver. We met other Abeba drivers on the road and they all had great personalities. What also made the trip so wonderful was the staff who organized and reserved all the hotels and local side trips. If you want to see Africa…go to Ethiopia!!!! It is all about the people. It’s safe!! The people are enthusiastic to see you and welcome you. Our trip took us from Addis Ababa, Bahir Dar, Lake Tana, Gonder ( Timkat Festival…which was incredible. The most unbelievable experience. And especially if your driver gets Anteane Nigussie as your local guide for the Royal Enclosure in Gonder ( He knows the castles and Gonder in such great detail ) , You will love him. He works in the Fortress area with all the castles ), Simien Mts. ( Incredible Mt. scenery and hiking and Baboons that you can sit among, you won’t believe it) , Askum, Mekele, Tigray, Lalibela ( go to the Torpedo Club for some Tej (local wine and local shoulder dancing …..and you will dance), and then at sunset make sure you eat at the incredible Restaurant Ben Abeba…..unbelievable view, it is the one at the end of town that looks like a giant flower or space ship, you will love the Scottish expat owner and her Ethiopian partner, but most of all you will love the food ), Awah Falls Nat. Park, and then down to the south to the tribes. We did it all and it went without a hitch, which is hard to accomplish. 30 days in a Toyota Cruiser!!! We didn’t do any flying and had some long drives---but we love being on the road and seeing all the people. We travel a lot and know what to expect and know how to roll with the unexpected. If you engage yourself with the people, return their enthusiasm, don’t hesitate to talk to them, ask them about their lives, look at life thru their eyes, and drink a little Tej (local wine) you will love this country. Abeba Tours will give you a great experience for a very reasonable cost!!!! We did it on the budget level. Let them take care of you and you won’t regret it!! If while traveling and you want to change anything, they will do their best to accommodate you. Just a quick email to thank you so much for all the help with my trip. I really enjoyed Ethiopia and think that it is an extremely beautiful and interesting country. All of my travel plans worked like clockwork and thanks so much for your organization. All of the guides I had were good, but I would like to mention that I thought the guide that I had in Harar was particularly good – I forget his name, but hope you have it in your records. Keep well and good luck for this year. 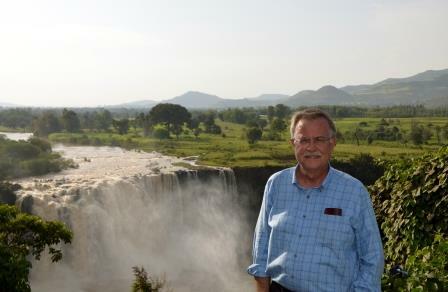 Steve: Dear Abeba Tours, We are now back home after the extraordinary tour of Northern Ethiopia you put together for us. From our first contact with you, to which you responded in flawless English, through to our departure from Addis, all your representatives from Abeba Tours were exemplary in their knowledge, friendliness, and professionalism. One never travels to such countries without expecting a few things to go wrong and I was delighted with the speed with which you sorted out those few things that did. I wouldn't hesitate to recommend your company to anyone who asks. Thank you again for everything you did for us. Isabel: Abeba Tours organised our trip brilliantly. Abeba Tours provided us with excellent service for our trip to Awash National Park. Our driver, Tigist, was knowledgeable, polite, and flexible. We enjoyed our time with him very much ! He was an excellent driver and guide and definitely true to the meaning of his name "Patience". Our rep in Addis Ababa, Shemels, was very professional and an outstanding help when we needed him. Thanks to all at Abeba Tours who helped to make our visit go smoothly! 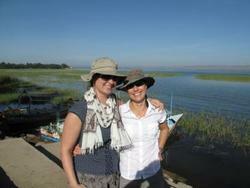 When we return to Ethiopia we will most assuredly use Abeba Tours! 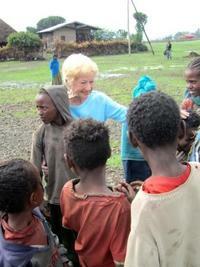 In July of 2011, my 85-year old mom and I traveled to Ethiopia. She won't go anywhere if she has to go on a tour, so we are always looking for independent travel options. On a guidebook's recommendation, I contacted Abeba Tours prior to our arrival and was immediately pleased with their professional, no pressure, no hustle approach. We spent over two weeks traveling in the Historic North during the "rainy season" (the weather was terrific the whole time! 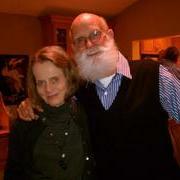 ), with an informed, personal driver who saw after our every need. The price was fair and competitive with other agencies. I highly encourage anyone to go to Ethiopia, don't let the words "rainy season" deter you, and use the excellent Abeba Tours for your travel needs. 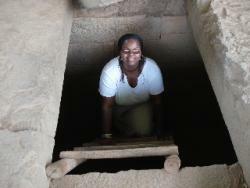 I have just returned from my wonderful historical vacation to Ethiopia. I enjoyed my time as Abeba Tours made my trip a wonderful experience. I took a 5 day tour out of my 14-day break in Ethiopia with Abeba Tours and visited Bahir Dar, Gondar and the Falasha Jewish Village. The package was fitted to what I asked for. Thanks to the tour driver Asma and tour guides for their well-informed history of Ethiopia. I don’t think I would have enjoyed my trip so much if it wasn’t for Abeba Tours. Thank you so much. Sure to be back again to complete more touring. The scenery on my travels via the tour to each place was beautiful. We just returned from a two week trip from Ethiopia. We chose Abeba Tours only because they were the first ones to respond on our list among all the tour companies. Little did we know what a lucky coincidence it was. We visited Lalibela for a few days, then headed down to the Lower Omo Valley for 10 days. Tania the proprietor was tireless in answering all of our questions before the trip and all of our guides were friendly and knowledgeable while traveling. They all went out of their way to make sure we had everything we needed. Our driver was exceptional, driving in Ethiopia can be a challenge at least to a foreigner. We couldn't have been happier, thanks for a great trip! In March 2011, my husband and I embarked on an adventure we will surely not forget anytime soon. Our destination - Ethiopia. We met up with 9 wonderful people and volunteered with Habitat for Humanity for 2 weeks in a city of Kombolcha. We met very wonderful people and had a simply amazing time. After returning to Addis we (Harv, myself and Ravi, a friend from our HFH team) went on a seven day Northern Historical tour, which was so well planned by Abeba Tours. Ethiopian Airlines does a great job getting us to our destinations. Our first stop was Bahir Dar, where we went on a boat ride on Lake Tana and visited a monastery, men only so I bought some bananas from the monks and shared them with another lady and had a chat by the lake. Then off to the Blue Nile Falls, the road was a bit to be desired but the hike and the falls were well worth the ride getting there. The next day off to Gondar, we absolutely love this town. We could see the castle from our hotel patio. The castle is simply amazing and our tour guide was so engaging, what a wonderful young man. We also visited a church in Gondar. 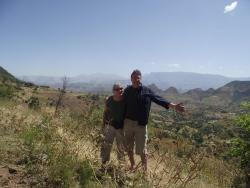 Then we took a day trip up the Simien Mountains, the view is spectacular, the baboons, friendly but keep their distance. Then off to Axum, took in the historical sites, the stellae's, the churches, met up with a caravan of camels on the way to a market, and explored the local restaurants. 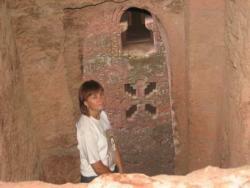 Our last stop on the tour was Lalibela, where we stayed 2 nights. We visited the rock-hewn churches. We have been to Petra in Jordan, which are very impressive, however these churches are even more of an architectural display. It is so amazing how these are as beautiful on the inside as they are on the outside. We also took a drive the next day to visit a church built in a cave. Then back to Addis where we were greeted by an Abeba Tours driver who was so amazing, he took us around Addis and did some shopping with us. All I can say is I would highly recommend Abeba Tours to anyone who asks. The guides are very knowledgeable, the hotels where new and comfortable and most of all, they took care of every detail of our tour. We have just spent 4 amazing weeks touring Ethiopia with the assistance of the folks at Abeba Tours. We travelled parts of the north, east and south, and were extremely pleased with the itinerary recommended to us. Our driver Jonie was wonderfully skilled, professional, personable and helpful. He was always concerned that we were enjoying our trip to the fullest, that our accommodation was acceptable and he was always looking for the best places for us to eat. He even climbed Debre Damo with Ken! It was especially good to know that Jonie had the constant telephone support of the office in Addis Ababa to make sure our trip went smoothly. We especially appreciated the visits arranged for us to villages in the south. It was so amazing to spend time with a Hamar mother in her house drinking tea and talking about her family and her life. Our only regret was not having more time for more Ethiopia explorations. We whole heartedly recommend Abeba Tours. I cannot praise the team from Abeba Tours highly enough for their flawless arrangements of this most enjoyable trip. First of all: it was easy to fix everything from home by email. Even when I came up with all sorts of last-minute questions and alterations to the schedule, I received very quick and professional feedback. On top of that, they look after their customers in a very personal way. I arrived as a stranger - but left as a friend. The trip itself could not have been arranged better: I had never expected, that it would run so smooth, trouble-free and on time! Drivers, guides and all the staff on the trek were all very nice and helpful people. I want to praise especially Efrem from Bahar Dar, Mengesha, my guide in the Simien Mountains and Tedros from Axum - they are great guys! I will certainly always remember the magnificient landcsape of the Simien Mountains, the ancient churches and historical buildings and the many, many impressions en-route. Ethiopia has such a rich and unique culture that renders you speechless. It was for sure not the last time that I have visited this great country. 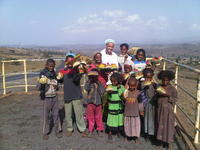 We have just returned from a 23 day trip to Ethiopia, organised by Abeba Tours. We visited the North and the South West, with an itinerary developed and agreed with Abeba, who demonstrated their professionalism, expertise and commitment to customer service to the full! The highlight of our trip was the time spent visiting rock-hewn churches in Tigre. We were lucky enough to have, looking after us in the South, the best driver in the whole of Ethiopia – Sammy! 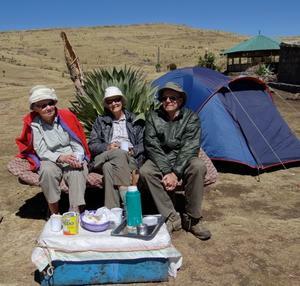 Such was our enjoyment and fascination with our best trip of a life-time that we are already planning to return in 2011, with the co-operation of Abeba Tours, to extend the Ethiopian experience further. 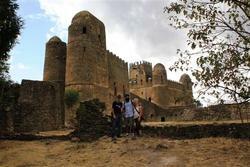 Just returned from a 7 day northern trip with Abeba Tours to Bahir Dar, Gondor and Lalibela. My driver, Ashu, was incredibly professional, courteous and caring. I had great support from both Abeba Tours and Ethiopian Airlines throughout the tour as my luggage never arrived (thanks to SAA). I would recommend Abeba Tours to anyone considering touring Ethiopia - they are knowledgeable and I received great service from the first e-mail correspondence to the final transfer to the airport. I hope to return! It has been an aspiration for a long time for us to visit Ethiopia. As a couple that normally travel independently, Abeba Tours provided the perfect balance with us having the freedom to stay and eat wherever but ensuring that we did not miss anything en route. We had a fantastic driver who always was there when we needed some advice or information and helped with anything that needed organisation. We followed the Northern Historical Route and saw all what we expected and more. Highlights included trekking in the Simien Moutains and visiting some of the churches in the Tigray area. All guides that we used on the advice of our driver were excellent without exception. In short, a wonderful experience that we will cherish for all time! Rest assured that Abeba Tours really understand their customers and will deliver well beyond expectations. Thanks for everything! We have just returned home and wanted to let you know that we had a great time on the trek. Much of the credit is due to the cook, who did a great job in coordinating our trip and cooked up meals that we all enjoyed - including our kids. His cooking was fresh and tasty and the combination of vegetable soup and pasta made a great start to the adventure for my son who loves pasta and was getting a bit nervous about the local food. We also appreciated his thoughtfulness especially in regards to the needs of our kids. On the last day he coordinated a mule to carry our daughter, who was starting to struggle. With her riding on the mule we made Imet Gogo in good time and this motivated her to complete the trek well. The others on the trek were also great including the guide, the scout and the assitant cook. All round it was a great trek and one of the main highlights of our trip. It features in all our stories as we recount our holiday to friends and we will always remember the dramatic views of the Simiens as well as the friendship of the trekking party that helped us see it all. Thanks again for organizing the trek for us. We took a 10-day tour to the Omo Valley organized by Abeba Tours. The agency is run by very enthusiastic people with real passion for what they do. We really enjoyed the company of our driver who became our friend after the first day of the journey. Thanks to him we got a very deep understanding of Ethiopia and we had a lot of fun. Deciding to travel to a developing country can be a bit daunting but Abeba Tours put me at ease right from my first email with my countless questions. I told them the places that I wanted to visit and they helped me fashion a program that combined the cultural and especially the natural treasures of Ethiopia. I spent 15 days traveling in the Lower Omo Valley and the Danakil Depression. The guides and drivers were first rate; I learned so much about the people and customs from them. I came away with a respect and a love for this ancient land. 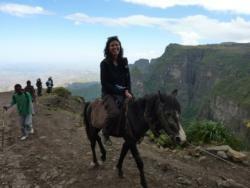 Ethiopia ranks as one of my top travel experiences and that is all thanks to Abeba Tours. I just wanted to write and let you know that I had a fantastic time on my trip down south through Abeba Tours back in February. The tour was truly a highlight of my 10 weeks in Ethiopia. Our driver Abi did an amazing job negotiating those roads and I felt 100% safe in his capable hands. Our guide Ashu did an excellent job in guiding us through the area and was truly a walking encyclopedia of knowledge about Ethiopia, the southern area and in the culture and customs of the local tribes. Both Abi and Ashu answered all of our questions and went out of their way to make our trip a memorable one. Thanks for organizing an excellent itinerary. We hired a 4x4 and driver from Abeba Tours last December and spent six weeks in Ethiopia travelling South, East and North. They worked out a perfect tailor made, yet flexible itinerary for us to make sure we visited all the places we were interested in - and at the best time to experience the markets and local festivities, such as Genna and Timket. We had a fascinating time and Abraham, our excellent driver, made sure we got there safely. We'd like to thank everybody at Abeba Tours for their outstanding customer service and for taking care of us so well during our time in Ethiopia. will be drawing on our experiences on this unforgettable trip for a long time - we even miss our daily injera! 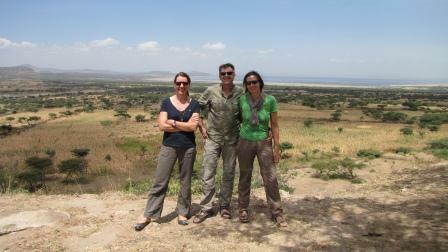 We had a wonderful two weeks tour with Abeba Tours in Northern Ethiopia. Our driver Henok was very professional and helpful. Ethiopia was a great experience and we hope to visit again. 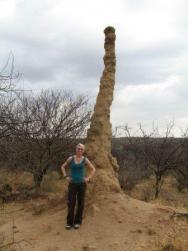 We had a fantastic time exploring the Omo Valley in December 2008. Abeba Tours made the whole process stress free and were excellent in arranging all the details of the tour. Before the tour, my email enquiries were responded to quickly and with detailed, relevant information. Our driver was knowledgeable, safe and entertaining. I have no hesitation in recommending them to anyone who wishes to do a tour of Ethiopia. 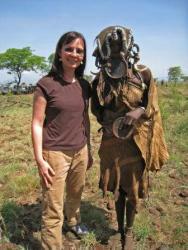 We took a 6-day trip at the very end of November (2008)...to the South Omo Valley. It was one of the most fascinating journeys we have ever taken. Our guides were Fasil and Makhbeb and our drivers were Derege and Melez. Our drivers did a first-class job navigating on barely passable dirt roads with no road signs, not hitting animals or people (and both were a challenge) and driving many hours, often into the night. Our guides were treasure troves of answers about the culture and local customs, and were by our sides at a moment's notice, tirelessly negotiating for purchases or arranging for photos on our behalf. No request was too small or too big, and they were always handled gracefully; we have never felt unsafe or neglected during this trip. Our escorts were not only proficient at their jobs, but they were among the nicest, friendliest, most decent individuals we've come to know. We hope you'll share our enthusiasm with them and with your future clients as well. You've put together a fascinating program and we can't thank you enough for it. Abeba Tours spent a considerable amount of time helping us get organized before our great trip to the Omo Valley. Upon arrival at 1:30am in Addis Ababa, Abeba Tours even helped us get accommodation after our hotel booking fell through. Our driver was an awesome gentleman and had us in stitches when we weren't in awe of the beauty and majesty of the Omo Valley. We were even lucky enough to see a Bull Jumping ceremony which was a huge highlight of my trip to Ethiopia. I have travelled far and wide on this beautiful planet, and you can't go wrong with Abeba Tours. They made my trip to the Omo Valley an experience I will cherish forever. I had an excellent trip to Northern Ethiopia with Abeba Tours. Abeba's tour guides are very knowledgeable about the history and the make up of each area. It was an amazing learning experience and I hope to visit again in the near future. Abeba Tours was the most professional company we found in Addis. They were very honest and clear and flexible. Our driver was fabulous. He managed to find us a very small, quiet bull jumping ceremony and negotiate with the tribe for us to celebrate with them. He helped us negotiate for crafts and for rooms and I am still in touch with him some months on. We been traveling with Abeba Tours Ethiopia on Northern Route in 2008. Our driver was like a father for us - he constantly was thinking about us and doing all the best - negotiating prices in cafes and hotels, arranging meals, etc. I would definitely advise to run with this family-run company. Suzanne and I enjoyed our stay, and especially your tour, very very much. Since I don't fly for KLM, and not likely to return to Addis too soon, it was a great experience and a very precious memory. I'm glad we have so many great photos. Thanks again for your hospitality and I wish you all the best. I organized a tour with Abeba Tours to visit the south of Ethiopia and everything was perfect. We rented two cars with drivers. The cars were in good condition and the drivers were very professional people. I will repeat with them for sure. Great service and recommended.